You are at:Home»FAQ»When Tracy Chapman will release a new album? Question: When Tracy Chapman will release a new album? Answer: Tracy Chapman’s latest album is Our Bright Future (released on November 10, 2008). Since then she hasn’t release any new one. 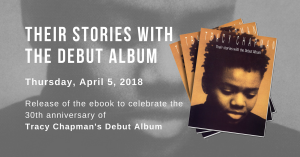 Stay tuned on this site (via Twitter, Facebook or the newsletter to be informed when Tracy Chapman’s new album releases). Who & what music influenced Tracy Chapman?? If, She tours in the US, I will be there luv this woman!